Our "Amazing Animals and Interesting Environments" Reading Clubs are on April 12th and we would love for you to join us! We are looking for 284 more volunteers to enjoy a fun morning of reading to kids. Please click here to submit your RSVP today. Then please join our April 12th event on Facebook to help spread the word with your friends. 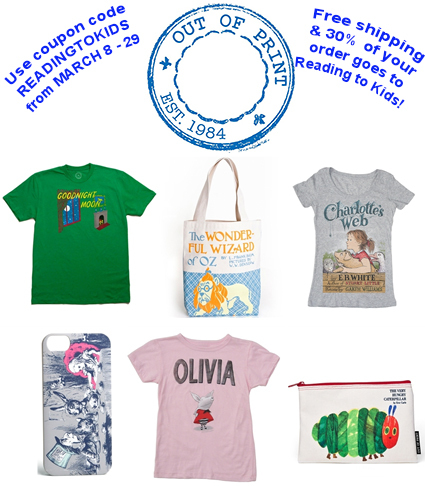 From March 8 - 29, Out of Print Clothing is offering free standard shipping and 30% of their proceeds to Reading to Kids! Their shirts and other items make great gifts for yourself and others, and until March 29th, they also benefit Reading to Kids! This year Reading to Kids turns 15 years old, and we'll be celebrating our quinceañera on Tuesday, April 29th at our Comedy Night and Silent Auction at the Hollywood Improv! Please mark your calendars for this hilarious evening hosted by internationally-known Mallory Lewis and Lamb Chop! See the puppet you grew up watching as she helps us celebrate with some of her naughtier "After Dark" material! Joining Lamb Chop will be a handful of hilarious comedians hand-picked by the world famous Hollywood Improv. You won't want to miss out on this event, so keep your eyes peeled for more updates! - Sign up for April 12th Clubs! - Buy a Cool Shirt & Earn $$ for R2K!